Our team is pleased to confirm its participation in the very 1st edition of EDEX 2018, to be held December 3-5 at the Egypt International Exhibition Centre, New Cairo, Egypt. With over 1.3 million military personnel, constituting the largest military power in Africa and one of the leading forces worldwide, Egypt is the ideal setting for a large-scale event for the sector. In addition, Egypt has historically maintained continuous investment in the latest weaponry as a defence strategy and has strengthened national production lines across a range of military complexes. The inaugural EDEX is fully supported by the Egyptian Armed Forces and presents a brand new opportunity for exhibitors (more than 300) to showcase the latest in technology, equipment and systems across land, sea, and air. The 1st edition is being held under the patronage of His Excellency, President Abdel Fattah El Sisi, the President of The Arab Republic of Egypt and Supreme Commander of the Egyptian Armed Forces. LACROIX is proud to be one of the first to confirm its participation in this 1st edition, and will be showcasing in the French Pavilion, headed by COGES-GICAT. At EDEX 2018, LACROIX will be showcasing in particular the GALIX AOS (Automated Obscuration System) : from detection to reaction, using green NT8 munition, to protect all types of land platforms (MBT, AMV, APC, LAV...). GALIX is particularly adapted for retrofitting and new programs. Come & try our 360 immersive DEMO!! 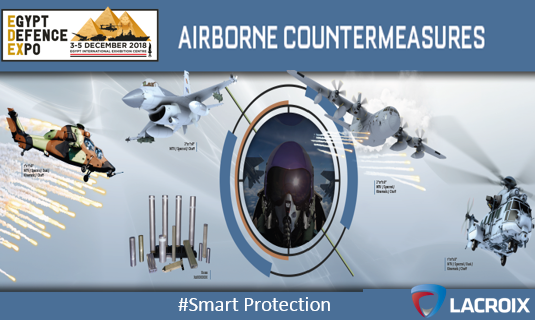 LACROIX will also present a full range of solutions in advanced airborne countermeasures in all types of calibers, particularly suited to the Egyptian Air Force's fleet of fighter jets (Mirage F5 & 2000, Rafale, F16, Mig, etc. ), helicopters (Apache, , Mil-Mi8, Black Hawk, SeaHawk, etc.) and large transport aircraft (Hercules C130, etc.). Our team will be at your disposal to discuss the SYLENA range of naval Decoy Launching Systems & dedicated SEACLAD range of munitions.